I attended the wake of a distant family member who passed away earlier this year. As we sat in his car porch, drinking our mineral water and muttering platitudes, a family member stood up and declared, “good riddance to bad rubbish” and then sat down again, looking satisfied. Much as I admire and enjoy eccentric behaviour and will always support freedom of speech, I thought this remark was a little ill-timed, denying the target his right to initiate the customary hundred million ringgit suit for defamation. I shall treat the passing year with appropriate reverence and respect. Suffice to say, it marked the 50th anniversary of the kidney transplant. Now, can we move on please? But before we do, let me spotlight a couple of non-events that didn’t seem to make the news. Firstly, have you noticed you are no longer being beseeched to buy land in England? And that owning a plot in Canada is no longer your passport to the good life? There are reasons for this. In March, Walton International Property Group, a company which enjoyed prominence here for a while, was raided by Bank Negara following suspected breaches of the Exchange Control Act. Bank Negara warned the public to be cautious of this type of land banking scheme. Then in October the Companies Commission carried out three simultaneous raids on UK Land International (M) Sdn Bhd, Profitable Plots Sdn Bhd and Edgeworth Properties (M) Sdn Bhd for alleged breaches of the Companies Act as well as the commission’s policy guidelines. It transpires that one of the companies is already facing winding up proceedings in the United Kingdom. According to the British Financial Services Authority, which initiated these winding up proceedings, UKLI Ltd had over 4,500 investors but none of the land sold had ever received planning permission. The other curious non-event was that the Kuala Lumpur 2020 City Plan was not gazetted. If you recall, this was the plan drafted in 2008 which reviewed permitted land use and densities. We are told that gazettal will take place in 2010 but there is still time for appeal. This may be your last chance, although only history will record whether this has been a quixotic attempt at reform or whether the task of master planning a city as dynamic as KL is really feasible. Now that 2009 is over, we can probably lower the storm flags over the property market, although I wouldn’t fold them up and stow them away just yet. Retail and office space looks well moderated but there is still a hefty supply of top-end condos in the pipeline. And we may not have seen the worst of the non-performing loans. Looking ahead, the Government may face difficulty controlling inflation, which is dubbed ‘the developers’ friend’ and which generally pushes values upwards. My long-range forecast is for our next boom to come around in 2013, and there has probably never been a better time to buy, than now. This is the last in my series, but before I wish you a Happy New Year and Goodbye, I want to share with you one abiding experience that has made this festive season a truly cheerful one for me. Coming out of Subway last week after a quick lunch, I nearly tripped over a young man sitting on the kerb, apparently gesticulating wildly into thin air. On closer inspection I saw he had his handphone propped between his knees. He had the camera on. Deaf and dumb, he was ‘talking’ to his friend. God bless him, and hooray for technology. There is hope for humanity yet. HO Hup Construction Company Bhd, the country's oldest construction company, expects a gross development value (GDV) of RM400 million for phase one of the Jalil Green City project. The mega integrated lifestyle development project comprising eight phases of development will commence construction next year. The first phase, consisting of eight-storey offices, five-storey offices and signature offices is expected to be completed in three years. "We expect to finish all eight phases of development over 24 hectares of land between eight and ten years. "Total GDV for the entire project will be RM1.6 billion," said Ho Hup Managing Director Lim Ching Choy to reporters after the company's extraordinary general meeting (EGM) here today. The remaining seven phases will consist of unique suites, shopping mall, "class A" office lots and residential projects. Lim said the company was now in the final phase of securing a RM120 million bank loan for the project. "Next year will be bright for us after sustaining several years of losses. We expect a huge turnover from this project and from one or two other deals which we hope to secure. We are optimistic of securing medium-sized government projects which we tender for recently," he said. Lim was confident the projects would return Ho Hup back to its glorious days before the financial meltdown. "Our market share currently is lower than a sub-contractor but we will hopefully increase it by the end of next year to a significant level," he added. Meanwhile, Ho Hup expects its property division to contribute 70 per cent for the group's annual turnover next year. "We have no specific contribution percentage for now as it is not significant like it was before. "The property division, before the company's financial meltdown, was contributing 80 per cent annually to group turnover," he said. Ho Hup is driven by its three arms namely its property, construction and trading divisions. Earlier, at the EGM, shareholders approved the resolution to dispose two parcels of freehold vacant land in Hulu Langat and Kuala Lumpur. When asked about the internal tussle between the management and major shareholders, Lim said the company was currently focusing on a new direction for the company next year. The tussle was made public in the media by major shareholder Low Tuck Choy, who alleged the Ho Hup management sold two parcels of lands in Balakong and Bukit Jalil below market value. "The 2.2 hectare land in Balakong for instance, has a lot of disadvantages. There is no proper road or pathway to the land. Besides there is a river and drain reserve which the new owner will have to give up to the government, as required by the law, if he wants to develop the land. "I believe the RM30 per square feet price tag is not low after considering all these obstacles that the buyer will have to face," Lim reiterated. He said the company was open to further negotiations and welcomed the support and response of shareholders at each annual general meeting or EGM. Low, however, was not present at the EGM. The group is expected to make a gain of RM171 million from the sale of properties that house its banking operations. CIMB Group is selling up to 65 properties that house its banking operations to the Employees Provident Fund (EPF) for RM302.4 million in a related-party sale and leaseback deal. 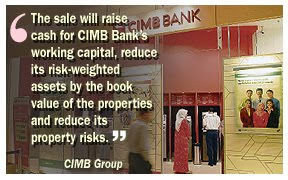 The group, in an announcement yesterday, said the sale will raise cash for CIMB Bank's working capital, reduce its risk-weighted assets by the book value of the properties and reduce its property risks. The group is expected to make a gain of RM171 million from the sale. The properties are currently used to house CIMB Group's banking business operations such as branches and offices. The sale and leaseback deal will be not be its first. It sold and leased back its current head office, Bangunan CIMB, and Menara Bumiputra-Commerce. In late 2007, CIMB group managing director and chief executive officer Datuk Seri Nazir Razak said it was mulling over a third sale and leaseback exercise on some buildings as part of its plan to manage capital more efficiently. The EPF is a major shareholder in CIMB Group, while Nazir is a member of the pension fund's investment panel. He abstained from voting on the deal. KUALA LUMPUR: CIMB Group Holdings Bhd said yesterday that it is disposing 65 properties to the Employees Provident Fund (EPF) for RM302.5mil as it is not in the business of owning properties. The group was expected to gain up to RM171mil from the disposal, it said in a filing with Bursa Malaysia. The rationale of the disposal was to reduce the group’s exposure to property risks as well as to raise money for working capital purposes of CIMB Bank, the group said. The properties are presently used to house CIMB Group’s banking business operations such as banking branches and banking offices. The disposal is expected to be completed in the first quarter of 2010, it said. It added that CIMB Bank had entered into a lease agreement with EPF for the properties concerned. HUNZA Properties Bhd has bought four plots of freehold land in Penang for RM82 million. In a statement to Bursa Malaysia, it said the rationale behind the proposed acquisition is because the group is principally involved in property development and investment, which are currently focused in Penang and Kuala Lumpur. The acquisition will enable the group to increase its landbank for future development and/or investment, at the same time continue its expansion plans in Penang. Due to encouraging response from the public, Mydin Mohamed Holdings Bhd will build a RM67 million wholesale hypermarket next March in Bandar Jasin Bistari, its fourth outlet in Malacca. Its managing director Datuk Ameer Ali Mydin said land acquisition for the six-hectare factory site will cost RM7 million and construction another RM60 million. He said the continued confidence in the people's purchasing power prompted Mydin Mohamed Holdings to invest in another hypermarket in the state. "The state government is offering various incentives to woo investors to turn Malacca into a shoppers' paradise for tourists," he said, adding that construction of the factory will begin in March 2010. "The hypermarket will be ready for commercial operations in May 2011 and provide business opportunities for local retailers," he told reporters in Malacca yesterday after a signing ceremony for the purchase of the factory land from the Melaka Customary Lands Development Corporation (Pertam). Malacca Chief Minister Datuk Seri Mohd Ali Rustam witnessed the signing of the agreement between Ameer, who signed on behalf of his company, while Pertam was represented by its deputy chairman Datuk As'ari Ibrahim. Ameer said Mydin's biggest hypermarket is operating at the Melaka International Trade Centre (MITC) and generated a monthly turnover of RM18 million while another two outlets operated at Melaka Sentral.